San Jose, CA – Fall is around the corner and Santana Row is stepping into the new season with exciting events, traditional celebrations and special offers. In September, the Tech Museum of Innovation and Santana Row partners on a first ever “tech walk,” a benefit event that pairs tech with good eats and great shopping. Next up, the annual fall fashion shows changes it up by adding a sophisticated twist: an afternoon high tea and an evening nightclub theme. Fall cultural celebrations coming to The Row include the Mehregan Persian festival and Diwali, the Hindu festival of light. November brings Santana Row’s annual tree-lighting event, a favorite South Bay tradition for families. Thursday, Sept. 4, 6 p.m. to 9 p.m.
Join us for the first-ever tech walk, an only-in-Silicon Valley event that brings together two of San Jose’s favorite destinations. The evening’s highlight is a wine stroll around Santana Row with shop stops that will feature exhibits from The Tech. Exhibits include, “Your Life in Data” which lets participants experience the latest in wearable data gathering; “Minimasher,” a multiplayer electronic instrument; “3D Printing-The Future of Making,” demonstrations of the wonder of 3D; “Hacker vs. Hacker,” a challenge to break into a safe and win a prize; and “Scribble Scratch,” a modified consumer DJ controller that puts you in control of the DJ rig, the iconic Hip Hop instrument. Participating Santana Row merchants and restaurants include Left Bank Brasserie, Icebreaker Touchlab, KASH footwear, Orvis, Jest Jewels, Beau Bijou, Pasta Pomodoro, Flying Lizard Design, lululemon athletica, Diesel, Tommy Bahama, Donald J. Pliner, Gallery 85 and Hotel Valencia. Registration begins at 5:50 p.m. in Santana Row Park. The event is a benefit for The Tech Museum of Innovation. Tickets are $40 and available at SantanaRow.com. High Tea at 3 p.m. and Fashion on The Rocks at 6 p.m. Whether you like your fashion presented with a cup of tea or would rather sip a bold cocktail, Santana Row has a show to fit your style. Join the fashion flock for the annual fall fashion shows at Santana Row Park. The afternoon show features the hottest trends for fall served with high tea while the evening catwalk showcases fall looks amid a nightclub theme. High Tea at 3 p.m.: Love the tradition of high tea in a garden? This is the show for you. The afternoon event includes a tea-inspired cocktail and boxed tea sandwiches with .show featuring fall’s best stylish looks. After the show, head into the stores where you can shop while enjoying DJs, raffles and exclusive retail discounts. Tickets are $35. Fashion on the Rocks at 6 p.m.: For those who want a walk on the wild side, the evening show channels the vibe of a nightclub with a live DJ and a few surprises. Guests will be treated to seat-side service from the model waiters. Offerings include a signature cocktail or champagne, a bite box and a passport to the hottest after-parties. Our DJs will take you from the runways into the store where champagne, light bites and exclusive retail discounts await. Tickets are $35 for the afternoon show and $50 for the evening show. Both shows are a benefit for the Silicon Valley Community Foundation. Tickets can be purchased online at SantanaRow.com or for cash-only at the Santana Row concierge office. Learn all about family safety from professionals and meet the everyday heroes who keep us safe! Enjoy live entertainment, arts and crafts, face painting, music, balloon art, story time and more. Details: 10 a.m. to noon at Park Valencia. Mommy & Me and Daddies, Too is a free kids’ club held on the second Tuesday of every month from May through December. For more information, call 408.551.4611 or visit SantanaRow.com. Sunday, September 14, 9 a.m.
Yogis take over Santana Row Boulevard for the second annual Yoga on The Row! The free class will be centered in Santana Row Park, and participants are invited to line both sides of the main boulevard from Olsen Drive to Olin Avenue, an area closed off to traffic. Registration begins at 8:30 a.m. and class begins at 9:00 a.m. There’s an after-party in Park Valencia and special brunch and shopping offers will be distributed to all attendees. Last year, more than 450 yoga enthusiasts attended and the goal this year is having 800 yogis put down their mats at Santana Row. For more information, contact Lululemon Santana Row at 408.557.8721. Take the stress out of driving to the new stadium and finding a parking spot on game days by taking the Santana Row shuttle! Make your individual or group reservation online and you’ll be set to go. Buses leave Santana Row approximately 90 minutes before game time and depart the stadium one hour after the game ends. Your ticket includes free parking in a special reserved lot for immediate access to the buses and the round trip to and from the game. Also included are Santana Row shopping and dining specials at select restaurants, such as bottomless mimosas, prix fixe menus, private tailgate pre-parties with cash bar and extended happy hour offerings. Ticket are $50 per person. When you arrive at Santana Row, park your vehicle in the designated, secured parking lot on Winchester Boulevard in the former Century 21 Theatre parking lot. Then walk across Winchester Blvd on to Olsen Drive and registration and bus will be waiting to load in front of CineArts Theatre. The bus will depart at the scheduled time, and will not wait for passengers. The bus will park at the official shuttle drop-off location at Levi’s Stadium. One hour after the conclusion of the game, the bus will depart from the same location. All passengers not on bus at the specified departure time will not receive transportation back to Santana Row. For more information, check SantanaRow.com or contact the Santana Row concierge office: 408.551.4611. Tuesday, September 23, 5:30 p.m. to 9 p.m.
Santana Row celebrates the arrival of fall with Mehregan, a Persian fall festival that has been celebrated for more than 3,000 years. In partnership with the Iranian Federated Women’s Club, the event will feature live music and cultural celebrations marking the first day of fall. Festivities will take place on the stage in Park Valencia. This event is free and open to the public. For more information, visit SantanaRow.com. Saturdays, through September 27, 8:30 a.m. Practice your sun salutations under the sunshine at Park Valencia every Saturday morning at 9 a.m. through September. The complimentary classes are held outdoors, with registration opening at 8:30 a.m. For more information, contact Lululemon, 408.557.8721. Please note that Lululemon is in a temporary location near Santana Row Park while the store undergoes a renovation. Santana Row partners with 100 OCT to present Cars & Croissants on The Row, a monthly gathering for exotic car owners and car enthusiasts. On the fourth Saturday of the month for the rest of the year, exotic car owners are invited to park on Santana Row Boulevard from Alyssum Lane to Tatum Boulevard, display their cars and mingle with other enthusiasts. The morning meet-up for coffee, croissants and cars drew 400 people and 60 cars during the first event and continues to grow in popularity. This event is free and open to the public. Spend $250 or more on a Santana Row gift card in September and receive a complimentary pair of tickets to see the band, Kings of Leon, at The Concord Pavilion on Friday, Oct. 1. The offer is limited to one pair of tickets per person, while supplies last. activities for all ages. The entertainment program includes chef demonstrations by Amber India, Bollywood dances and dramatic performances depicting the significance of Diwali. Festivities will take place in Santana Row Park. This event is free and open to the public. For more information, visit SantanaRow.com. Trick-or-treat around The Row and enjoy pumpkin decorating, live musical performances and other activities during this popular fall event for children. Details: 10 a.m. to noon at Park Valencia. Mommy & Me and Daddies,Too is a free kids club held on the second Tuesday of every month from May through December. For more information, call 408.551.4611 or visit SantanaRow.com. The holidays remind us to pull together and help those less fortunate. November’s program encourages kids to bring a canned food item that will be donated to Second Harvest Food Bank. Holiday fun includes face painting, balloon animals, arts and crafts Kids will be entertained by music and live performances. Details: 10 a.m. to noon at Park Valencia. Mommy & Me & Daddies, Too is a free kids’ club held on the second Tuesday of every month from May through December. For more information, call 408.551.4611 or visit SantanaRow.com. Tuesday, Nov. 18, 3 p.m. to 9 p.m.
Santana Row kicks off the 2014 holiday season with the annual Light Up the Row tree lighting ceremony, a joyous day of celebration for the entire family. The day of holiday festivities begins at 3 p.m. with photos with performances by dancers from Ballet San Jose. The fun continues throughout the afternoon and evening with live music, costumed characters, special guests and performances by local theater and dance groups. The highlight of the day takes place at 7 p.m. in Santana Row Park with the lighting of the 40-foot Christmas tree, one of the most anticipated holiday events in Silicon Valley. Many of the restaurants will offer dining specials, kid-friendly menus and holiday-themed cocktails during the event. In-store parties, hot chocolate sampling, cookies and appetizers will also add to the festivities of the day. Details: The celebration is scheduled from 3 p.m. to 9 p.m., with tree lighting slated for 7 p.m. in Santana Row Park. More details about the entertainment will be available closer to the event at SantanaRow.com. The day-after-Thanksgiving shopping tradition at Santana Row includes discounts, door buster morning specials and treats throughout the day. Spend $1,000 or more on Black Friday and receive two tickets to the San Francisco performance of Cirque du Soleil’s Kurios. Many stores are offering customers 25 percent to 70 percent off merchandise all weekend with giveaways such as free totes, gift cards with purchase and holiday refreshments throughout the day. Santana Row hours are 9 a.m. to 10 p.m. on Black Friday, with many stories extending hours during the Black Friday weekend. For a comprehensive listing of retail and restaurant events and offerings, visit SantanaRow.com. The annual coat drive begins at 6 a.m. on the day after Thanksgiving with KTVU broadcasting live throughout the day from Santana Row Park. Donate a new or gently used coat and it will be given to a needy family this winter. The first 100 people to donate a coat will receive a $10 Santana Row Gift Card. Drop-off locations include CineArts Theatre, Crate & Barrel, Sur La Table and the Santana Row Concierge. The charity coat drive continues through Dec. 31. For more information call 408.551.4611 or visit SantanaRow.com. Here’s hoping the drought ends! 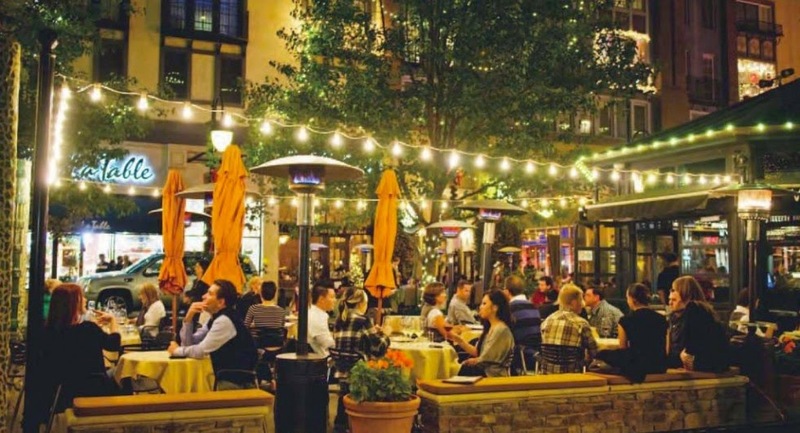 Santana Row is optimistic and wants to reward shoppers and diners braving bad weather. When there’s a 70 percent or greater chance for rain, they will be offered discounts that include 15 percent off purchases at participating shops and restaurants, a free signature Santana Row golf umbrella for customers who spend $150 anywhere on The Row and a $20 gift certificate to a participating shop or restaurant for customers who spend $300 on a designated Rainy Day. No need to get wet: Customers can pick up a complimentary umbrella to use while shopping and dining and then return it before leaving. The yellow umbrellas are conveniently located throughout The Row: outside Concierge, Via between Village California Bistro and Lark Creek Blue and the valet parking lot in the Winchester Parking Garage. Wednesday, Dec. 17, 4 p.m. to 6 p.m.
Santana Row celebrates the first night of the Jewish Festival of Lights with kosher treats, entertainment and activities that include decorating dreidels, Jewish story time, arts & crafts and the lighting of the Menorah. The evening is co-hosted with the Jewish Federation of Silicon Valley and The PJ Library. The celebration will take place from 4 p.m. to 6 p.m. at Park Valencia. Dec. 7, 11 a.m. to 2 p.m.
Bring your canine and feline friends to Santana Row's Park Valencia for a keepsake photo with Santa Claus. Photos are $20 and a portion of the proceeds will benefit Humane Society Silicon Valley. Registration begins at 10:30 a.m. at Park Valencia. The last Mommy & Me of the year will be held in the lobby of the CineArts Theatre and will include live entertainment from Andy Z, story time with Mrs. Claus, sampling from Happy Baby Brands, mini manicures from Lavande nail salon, a raffle from The Container Store, arts and crafts with Action Day Primary Plus, Balloon Animals and Face Painting and more! Details: 10 a.m. to noon at CineArts Theatre. Mommy & Me & Daddies, Too is a free kids’ club held on the second Tuesday of every month from May through December. For more information, call 408.551.4611 or visit www.SantanaRow.com. Santana Row’s Twitter campaign and photo contest continues through the @SantanaRow Twitter handle. The contest invites anyone at Santana Row to Tweet or Instagram photos of a new outfit, haircut, meal, event or artsy shots and then tag it with the hash tag #LifeonTheRow. Every month, Santana Row will post an album on Facebook with all of the photos with the #LifeonTheRow hash tag. The person who took the best or most original photo will win a gift card to a Santana Row restaurant.